You’re supposed to be able to earn flashy new gear via Black Ops 4’s Contraband Stream by either playing the game or spending money. But since arrival, it’s become clear that getting everything without opening your wallet is extremely difficult, and the whole thing feels like a scheme to get players to spend. Instead of the “Supply Drop” random loot boxes of previous games, Call of Duty: Black Ops 4 adopted a different approach for earning new cosmetic gear. Contraband Stream, which is an event-based progression system that rewards players for playing standard multiplayer and Blackout. During these limited-time events, players can level up through the Contraband Stream’s tiers and, in so doing, unlock items such as face paints, character skins, emotes, and cosmetic gun variants. If you’d rather just skip all the playing and buy the items outright, you can. Originally, I praised this newly introduced Contraband Stream for being a similar progression system as Fortnite’s Battle Pass. You’re not forced to buy anything extra, and everyone can earn the items simply by playing. It all sounds great until you dump a ton of hours into the game and realize you haven’t progressed very far. It doesn’t matter how many games you win or how much experience points you earn, leveling up the tiers is based solely how many hours you put in. And you need to put in a lot of hours. While I can understand the reasoning behind making the earn rate even across all skill levels of players, the current rate progression through the tiers feel impossible to complete in the amount of time given. There are more than 200 tiers in the first Contraband Stream, called Operation First Strike, and this first event gives players only 50 days to complete it. One hour of play seems to equal one tier, which means you’d need to spend over 200 hours across 50 days to collect everything. That’s a minimum of four hours every single day of the event—and remember, that’s time spent in matches, so it doesn’t include the time you have to spend partying up with friends or waiting between games. Initially, the slow progression in the Contraband Stream seemed like a glitch or miscalculation. But since it hasn’t been changed, it now appears to be an intentional strategy to persuade players to buy COD Points, the game’s premium currency. As of October 31, you can buy and move up tiers by purchasing them for 100 COD Points each. Call of Duty’s currency can be purchased in various bundles ranging from 200 COD Points for $1.99 to 5000 for $39.99. This means it would cost a minimum of $160 to buy all the tiers in the Contraband Stream. 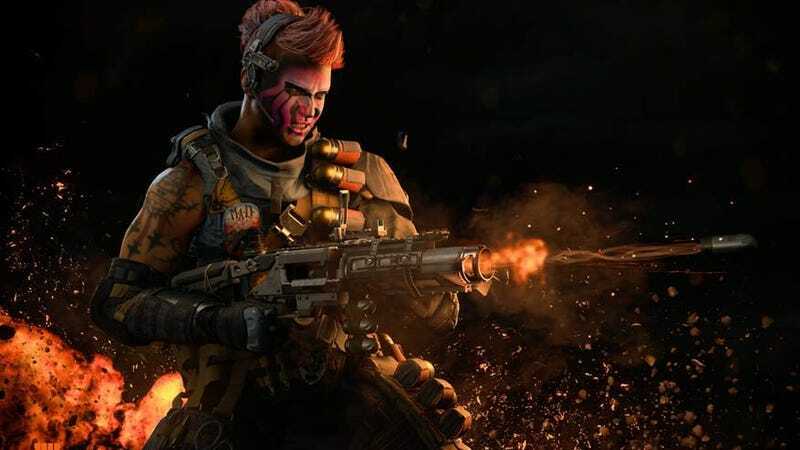 Black Ops 4’s official trailer for the Black Market Contraband Stream calls it “a path where all you need to do is play, and you’ll get access to some of the best items in the game.” This sounds like you’re being rewarded instead of hustled, but some of the most sought-after items in the stream are the cosmetic weapons, such as the GKS variant that turns into a unicorn at tier 105 or the fancy ICR-7 assault rifle variant at level 200. This is a terrible grind to get those coveted weapon skins, especially for casual players unable to devote over four hours every single day. I play Black Ops 4 every night, and I’m currently sitting at tier 53. It would cost me 14700 COD Points, or around $100, to unlock the remaining tiers, if I wanted to impatiently complete the event now for that tier 200 ICR-7 variant. You can even buy Special Orders for COD Points, which currently range from 500-800 points each. These orders let you play to level up tiers for specific cosmetic packs for the Black Ops 4 Specialists, which include 5 to10 items. I paid 800 COD Points for this weekend’s Battery “Cathedral” pack, and I’m still putting in the playtime to unlock the remaining items, including a cool face paint that will take me about five more hours of game time. Buying cosmetics doesn’t feel bad in a free-to-play game like Fortnite, but for players who already dropped at least $60 on the base game and possibly another $50 for the DLC in the Black Ops Pass, the push to buy skins and guns with COD Points doesn’t land as well. Black Ops 4 is still really fun to play, and you obviously don’t need these cosmetics to enjoy the game, but this still feels more like a push to get players to pay up, versus a rewarding incentive to keep playing. This progression model should either move faster with in-game time, or include some more in-game challenges to allow even casual players the chance to finish leveling the tiers without spending more money. We all deserve unicorn guns, even those of us without 100 extra dollars or 200 free hours.